Stop the Tory union-busters! Stop the cuts! The very right of trade unions to exist and organise effectively is under threat. The new Tory anti-union laws will outlaw strikes if less than 50% of members voted in a ballot with an even stricter threshold for workers in ‘essential’ services. If these laws operate unchallenged, it will be a green light for bosses to ride roughshod over workplace agreements and victimise union reps.
It’s no accident these plans were announced 6 weeks before Osborne’s first post-election budget last year. The Tories – elected by just 24% of the electorate – fully understand that the unions, with over 6 million members, can be an obstacle to another wave of vicious cuts – if they take decisive mass action, particularly on the scale of a 24 hour general strike. We have no choice but to resist. Last year’s TUC Congress passed a resolution calling for a special Congress to resist the Trade Union Act. As the regulations came in on March 1st, we call for such a conference to be organised. 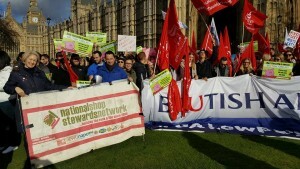 The NSSN was initiated by the RMT and their former general secretary the late Bob Crow in 2006. 9 national unions – RMT, PCS, CWU, NUM, POA, NUJ, BFAWU, NAPO & FBU – officially support our campaigning work, as well as many union branches, shop stewards committees and trades councils. The NSSN has played a role with others in TUC Congress delegates’ decision to endorse coordinated action, and we have worked to keep this strategy in profile. After even more Tory cuts it’s not only practical but necessary. Our other campaigning work involves supporting workers in struggle, and those victimised for the “crime” of defending their members’ from the employers’ brutal cuts. We also attract young people wanting to fight back against zero-hour contracts and poverty pay, but who have, as yet, no experience of trade unions. We proudly fight for a £10/hr minimum wage. We have a website, Facebook group, twitter account, and a regular weekly e-bulletin. All are available to trade unionists and their organisations to publicise their disputes, events etc. Please feel free to use these platforms. Invitations to speak at your union meetings are also welcome. Affiliation to the NSSN is £50. Can your union stump up a big donation? One conference alone costs thousands to organise. Individuals and branches can also take out regular standing orders of a few pounds every month to ‘National Shop Stewards Network’, HSBC – sort code 40-06-41, account number 90143790. Post any cheques to above address.